The Great Library of Alexandria conjures images of bearded scholars strolling marble halls, studying rolls of papyri at large wooden tables, or arguing with colleagues under covered walkways. The loss of “the world’s knowledge” through wanton destruction is a metaphor for the coming of the Dark Ages in Europe. But what was the Great Library really and how was it destroyed? After Alexander the Great’s death in 323 BC, his general Ptolemy Soter I took over the province of Egypt and his descendants ruled until the death of Cleopatra in 30 BC. Ptolemy was advised by a former Athenian named Demetrius to “collect together books on kingship and the exercise of power, and to read them” so as to become more like Plato’s ideal philosopher-king. Ptolemy then sent a letter to his fellow rulers throughout the classical world asking that they send him works of authors of all kinds because he wished to collect “the books of all the peoples of the world.” This was the beginning of the Royal Library which eventually became the Great Library. Strabo didn’t describe the library because it wasn’t a separate building. Scrolls were kept on shelves under the covered walkway and in specially built niches throughout the Museum. The Museum and Library became one of the great learning centers of antiquity and attracted scholars from all over the world to study philosophy, mathematics, science, nature, literature, and medicine. The library collection continued to grow with some estimates that over 500,000 books were collected through purchase or confiscation. The collection became so large, that “daughter” libraries were formed outside the Museum. The best known was at the temple of Serapis in the Rakhotis district. These were open to the public. So how did the Great Library go up in flames? Some blame Julius Caesar. When he was besieged in the palace district in 48 BC, he started a fire among ships in the harbor which spread to warehouses on shore. Livy wrote that “by chance, at the time of the fire some 40,000 book scrolls of excellent quality were burned in a harbor warehouse.” Since they were in warehouses, these books were probably luxury trade goods, not part of the library which was safe behind walls. Almost three centuries later Queen Zenobia of Palmyra broke away from the Empire and briefly conquered Egypt in AD 269. Emperor Aurelian besieged Alexandria four years later and inflicted significant damage to the palace district. In 298, Emperor Diocletian completely destroyed the district while putting down an uprising. These acts of war probably did significant damage to the collection, but didn’t totally destroy it (think of the bravery of the Iraqi Museum workers who managed to salvage many of their most precious items from the looting after Baghdad fell.) The Museum and its library lived on, probably in a much reduced state, in and around the district known as Caesarium. Recent archaeology in that area has revealed an extensive system of lecture halls. As late as 415, we have sources referring to the Museum when Hypatia, the famous mathematician and Lady Philosopher of Alexandria was murdered. Paper (papyri, vellum) is a fragile medium and books are subject to fire, water, insects, thefts, and copy errors. It’s not surprising that so little has come down to us from ancient times. So we should be careful who and what we blame for the “Dark Ages” (which many medieval scholars would dispute were not that dark) and remember that what has survived did so because it was preserved by Christian monks and Muslim scholars. For nearly a thousand years, the Great Library waxed and waned in Alexandria, serving scholars and the public alike. 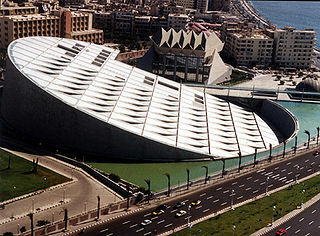 In October 2002, the newest incarnation was inaugurated: the Bibliotheca Alexandrina. In 1974, the Egyptian government embarked on an ambitious project to recoup the glory of the Great Library. The new one has shelf space for eight million books; houses three museums, four art galleries, a planetarium and a manuscript restoration lab in a gray Aswan granite building that looks like a tilted sundial (see picture above.) Like the original, the collections at the Bibliotheca Alexandrina are donated from all over the world. Print book and eBook now available in all digital formats. Like most bloggers, I obsess over my “views” and track which articles are most popular. 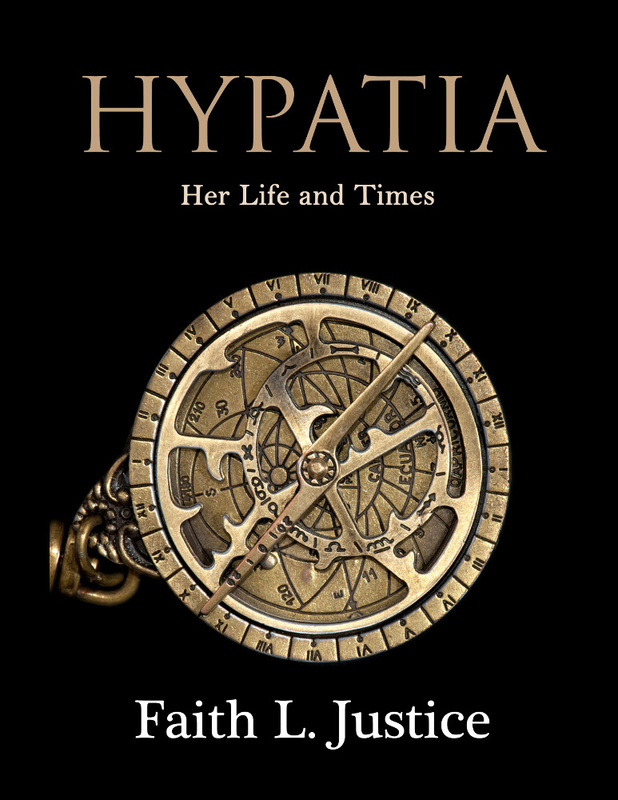 Hands down, anything about Hypatia draws the most readers and generates the most discussion. As a favor to my readers and Hypatia fans, I put all the material in one place. This article and many others from my website, this blog and guest posts are now collected in ebook and print versions (buy direct or order from any online or private bookstore). If you feel you can’t afford the book, contact me through this website and I’ll send you a free PDF copy. Check it out and let me know what you think! I am going to get addicted to this blog. I love it! I just feel smarter reading this saga… fascinating! I am an ardent fan! Thanks, Jean and Laurence! I hope to keep up the good work. Let’s not forget the Byzantines, who never lost it. The mistake we moderns often make is to suppose that if one library is lost, there were no others. Alexandria continued to be a center of philosophy and “science” down to the eve of the Arab invasion. John Philoponus has fair claim to being the first of the real scientists, given that he carried out experiments. The 500,000 figure is totally unrealistic when you compute the shelvage that would have been needed and the size of the building. Copying a scroll was a laborious thing and copyists would have had to make judgments of which ones to copy and which to let go. E.g., We have Strabo’s Geography; but not Eratosthenes earlier Geography for the simple reason that no one wanted to recopy an out-of-date book.